Joannie has a PhD in Nutritional Sciences and blogs about real food at AdHocGourmet. For years, people have been encouraged to eat more fish, because of its health benefits. Seafood contains plenty of healthy fats and lean protein. Many of us would like to eat more fish, but before we can eat more, we have to buy more. Well, "The best laid schemes of Mice and Men oft go awry, And leave us nothing but grief and pain, For promised joy!" (Robert Burns, 1785) Unfortunately, some may not have extensive knowledge of what constitutes fresh fish. I'm here to help. If the fish has bright, clear eyes, bright gills, firm flesh, and a fresh odor, this is the one you are looking for. Buy it, cook it, and eat it! There is little danger of getting infected from parasties like Tapeworm or bacteria like Salmonella with fresh, properly cooked fish. If the eyes are beginning to dull, the gill color has faded to a slight gray, and there is a slight odor, this fish is still ok to buy and eat. It's not optimal, but it is still safe. If the fish has dull, sunken eyes, a dull color, soft flesh, and a fishy odor, do not buy it. It is likely to be contaminated with bacteria and parasites that may give you nausea, diarrhea, headaches, dizziness, or worse. If you already bought it, throw it away. There is no need to take unnecessary risks for a little bit of savings. If its eyes are completely opaque, its gills are slimy, its flesh is completely soft, and there is a strong fishy odor, report it to a store manager or perhaps even a food inspector. This kind of fish is dangerous and will probably contaminate you. You've bought the freshest fish (category 1 above), now what? 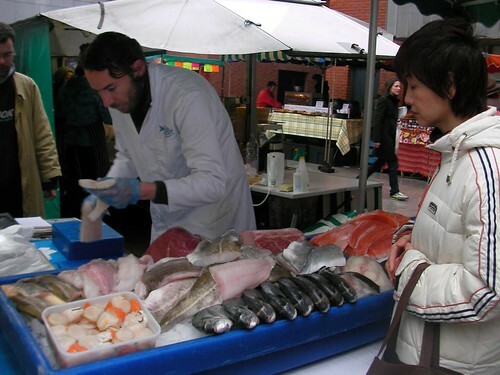 Keep your purchase cold as you leave the market, fish monger, etc. Place the fish immediately in the refrigerator once you get home. It's best to store seafood and fish between 32° and 38°F to keep pathogens at bay. Cook your beautiful fish until it is flaky and opaaque. This will kill off most of the pathogens. Walter Willett Eat, Drink, and Be Healthy. New York: Fireside, 2001. Morton Satin Food Alert: The Ultimate Sourcebook for Food Safety, 2nd ed.. New York: Facts on File, Inc., 2008.